6-7 Tbsp healthy mayonnaise (or any other dressing). In a large bowl mix the corn kernels, sliced onions, celery and potato. Add the mayonnaise and coat well. 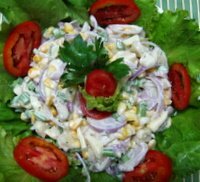 In a round serving bowl, arrange the lettuce leaves on the sides and add the mixed corn in the center. Arrange the sliced tomato on the sides. Refrigerate for 1 hour. Tip:- Just make sure that the mayonnaise is seasoned properly with salt and pepper, as we are not using any extra seasoning for the salad.